Let me guess – you’re not much of a web designer or developer and don’t wanna put in lots of time learning how to list a product in your e-shop catalogue or worse – spend a decent sum on a developer who will install and set up your online store for you? Right? This conclusion comes from the fact that you’re interested in these two great shopping carts in the title, but not sure whether you should prefer Big Cartel to Shopify or vice versa. The choice isn’t the easiest one, but let’s dot all the I’s to make a decision. Let’s start from the similarities between these platforms. Both Big Cartel and Shopify are hosted carts, which means you don’t have to worry about the hosting, security, downtime and stuff. There’s also no software to download – you just need a browser to access your store front-and backend. there are differences between these carts in their target audience. Big Cartel is a shopping cart for artists, as they put it. It is mainly for small stores with 300 products maximum. Shopify orientates at small and medium businesses, but big enterprises can use it successfully as well since there’s no limit for the number of products in the catalogue. How Much They Cost and What You Get for the Money? Instead of buying a lifetime license or getting a free copy of software, with these solutions you’ve got to pay monthly fees, depending on the plan you pick. Big Cartel offers a free plan with 5 products limit and very basic features and 3 paid plans, the most expensive one being $29.99 and 300 products limit. All of them provide inventory tracking, discount coupon codes, ability to customize the store and use your own domain name. This platform offers only credit/debit card and PayPal as payment methods. You will also be able to sell your products on Facebook. Shopify’s cheapest plan starts at $14, with 25 products limit - with all the other plans you can sell unlimited number of products, get 24/7 support, have custom URL, discount codes etc. Shopify also charges transaction fees, which get smaller as the price of the plan grows. As to payment gateways, they’re multiple – including PayPal, Authorize.net etc. You will also be provided Facebook and Ebay integration for better online presence. Shopify offers powerful marketing tools like discount coupons, gift cards, social media integration, great SEO features, mobile ready solution and much more. Another great advantage – Shopify is its own CMS, so that you could build a website around your store and get one more powerful channel to attract customers. What Can You Change to Make it Unique? Here, we’ll see how much customization does each of the carts in question allow. With Big Cartel, you can choose a theme from the already available ones and customize it if you know HTML and CSS. Shopify allows editing themes and templates, which are really numerous, and provides a network of designers and developers to help you out in need of a unique design or special app. However, as they fairly claim, there’s not much to be desired since Shopify provides practically every feature a storeowner might need, plus there are extensions in the app store to fulfill more sophisticated requests. How Much You Will Need to Learn? The mindset of creators of both Big Cartel and Shopify is to make the life of storeowners easier by at least offering a simple and easy to use software. They don’t require any programming skills (for regular use) or present a steep learning curve, so getting the hang of both will be pretty fast. They say, though, that Shopify is a bit more user friendly than Big Cartel, plus its support is available 24/7 unlike Big Cartel’s, which works the usual working hours. Are You Ready to Say Your Word Yet? Well, now no secrets left and you can clearly see your choices. Plan on a small designer store with basic functionality, smart look and for a reasonable price? Go for Big Cartel. Got plans to create a big store that’ll grow still bigger, as well as the revenue? Why not try Shopify? Actually, even if you’re in two minds, you can try the free plan from Big Cartel – no strings attached, and go for the free 14-days trial from Shopify to smash your doubts and choose the right platform. 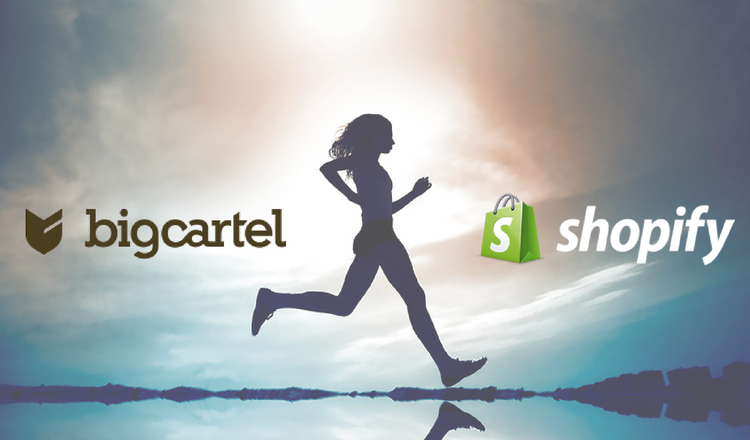 One more thing – if you happen to be running a store on Big Cartel already, which has almost outgrown its platform, you can switch to Shopify very easily with Cart2Cart. This online service is here to migrate your data from Big Cartel to Shopify in no time and with no efforts or losses on your side. You can try the free demo to see for yourself.